Pinch: A Microwave for Pralines? Bah! Humbug! Tomorrow I'm going to make peppermint bark. I vowed to do it this year and don't have many hours left. And speaking of things sneaking up on you, I thought we'd have to wait until November for a another one of those dates with all the same numbers. But I saw a sign for something happening on 1/1/11 today and realized both November and January will furnish two dates with lots of 1s. Would this be pleasing to the Count or not? One! One! One! One! The bark should be less tricky than those microwave pralines everyone was talking about from the NY Times. Our gracious hostess at a fabulous neighborhood dinner party followed that recipe and warned me of the its failings. (It should be mentioned that she was able to refashion them with incredible success using her own creative genius, a bit of salt, and cinnamon.) I decided to give pralines a whirl today but since I do not own a microwave went about it the old-fashioned way with a pot and candy thermometer. Truth to tell, after discovering the numbers on my candy thermometer had, like, washed off (?!?!? ), I went about candy making the really old-fashioned way with a cup of cold water. Anyway, pecan pralines will make a delightful addition to the dessert tray I'm planning to execute for New Year's Eve. Spread the pecans on a baking sheet and bake for about 5-10 minutes. Combine remaining ingredients except the pecans and vanilla in a large, heavy-bottomed saucepan. Cook until it reaches the soft ball stage, or between 235 and 240 degrees. In lieu of a candy thermometer, drizzle some of the hot candy into a glass of cold water. When ready, the candy ball should flatten between your fingers when you take it out of the water. Turn off the flame and set the pot on a back burner to cool for about 15 minutes. Line a baking sheet with parchment, foil or a silicone mat. Add the pecans and vanilla to the candy and stir vigorously (not so vigorously as to munch the pecans) for about a minute, or until the mixture creams a bit and loses its glossiness. Now work fast! Use two soup spoons and scoop the mixture into 2-inch-diameter mounds onto the lined baking sheet. If the mix becomes too hard to shape, or too sandy, reheat gently until it softens, adding scant spoonful of water if it looks too thick. Cool for 2-3 minutes, then resume spooning. 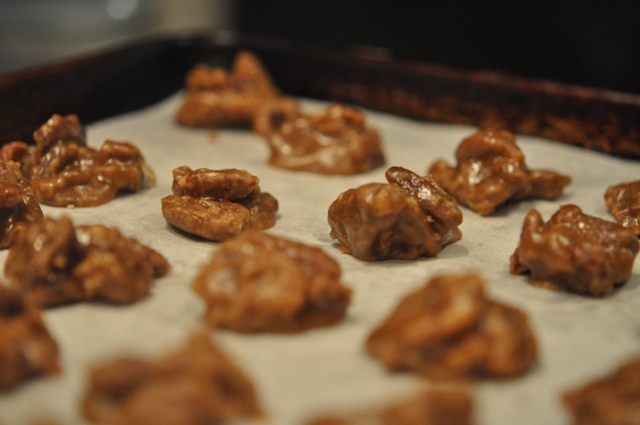 Let the pralines rest for 30 minutes before serving or storing. Store in an airtight container. One, one, one, one. Let's sing a song of one. How many is one? One. Kinda loses something toward the end, but that was one of my favorite part of SS.